Breezy Point isn’t next to the beach—it more or less is the beach. It’s a community built on sand. Occupying the Rockaway Peninsula that juts out of Queens, NY and into the Atlantic Ocean, residents are never more than a few minutes’ walk to the brackish bays that surround the thin strip of land. The flat landscape and many of the alleys and parking lots swim in loose drifts of sand. It’s not hard to see why this area was so badly damaged by Hurricane Sandy five years ago. When John Mutter was last in the Rockaways, he saw houses that were crushed to bits, and some that had burned down to their foundations. That was a few weeks after Sandy struck in October 2012, carrying a 12-foot storm surge and killing 43 people in New York City. The storm knocked over buildings, drowned basements, and caused tens of billions of dollars in damages. In Breezy Point, flooded streets prevented firefighters from putting out fires, which eventually consumed more than 100 homes. Now, on an unseasonably hot October afternoon, Mutter—who studies the socioeconomic effects of natural disasters at Columbia’s School of International and Public Affairs—is standing in the same neighborhood he witnessed in shambles five years ago, and he’s pleasantly surprised. New homes, many extravagantly large, line the streets, some with stickers still on the windows. Others are under construction, boxed in by green plywood fences. Most are now raised high off the ground to avoid rising seas and intense storms, both of which climate change is expected to exacerbate in the coming years. A few vacant lots signal homes that must have been destroyed, but there aren’t many. 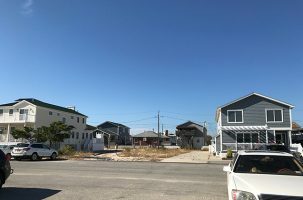 By all accounts, Breezy Point is doing well compared to some of the hurricane disaster sites Mutter has seen—in New Orleans, for example, many homes still haven’t been repaired or rebuilt since Hurricane Katrina hit in 2005. But how well has New York City really recovered, and how prepared are we for the next big storm? 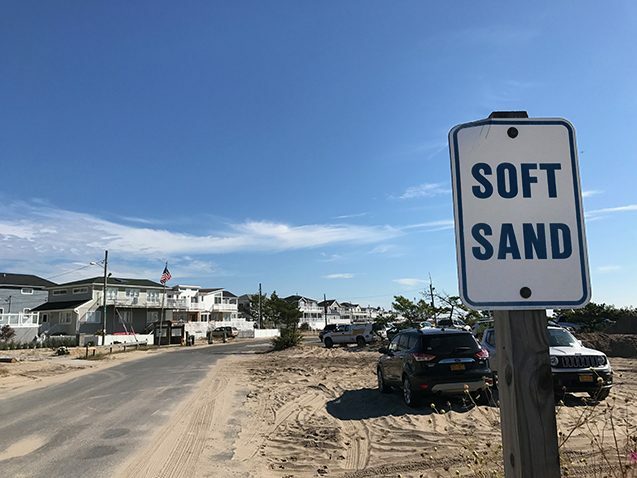 Behind the big shiny beachfront homes, the smaller homes that remain squat and huddled on the ground—some still damaged by floodwaters—indicate that not everyone has bounced back from the storm, and not everyone is prepared for the next one. 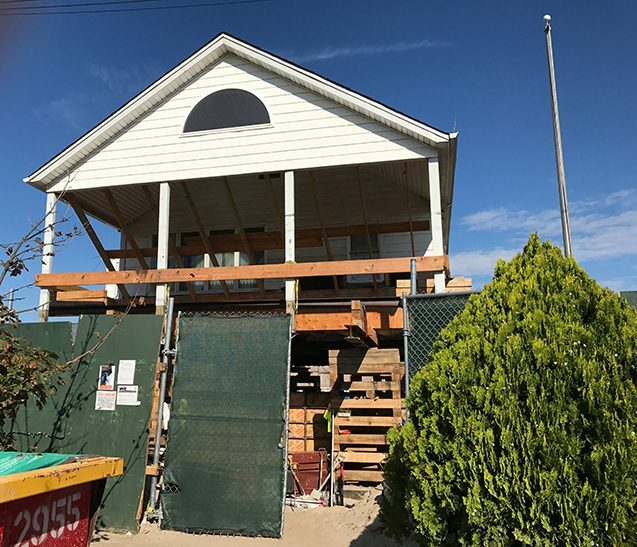 In Long Beach, not too far from the Rockaways, Sandy destroyed the entire ground floor of Earth Institute executive director Steve Cohen’s summer bungalow. Gutting and renovating rang up an $80,000 bill. “We had flood insurance, so it eventually covered it, but a lot of our neighbors didn’t,” he says. And while Cohen and his wife had enough savings to front the money to the contractors while waiting for the insurance to pay up, many of their neighbors didn’t. Some were homeless for a year or more, shacking up with family or friends. Almost without fail, natural disasters hit poorer people harder than wealthier people. “Those who are the most vulnerable when the sky is blue become even more vulnerable when the sky is gray,” says Jeff Schlegelmilch, the deputy director for Columbia’s National Center for Disaster Preparedness (NCDP). 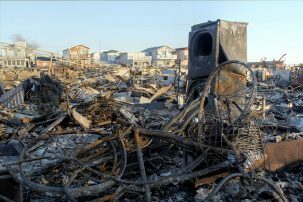 Just after Sandy, some Breezy Point houses looked unscathed, says Mutter, while others were badly damaged or completely destroyed. It’s the older, flimsier structures, owned by people who are less well-off, that fall into the second category. Poorer people are also less likely to have the resources to rebuild while they spend years fighting for help from the government or an insurance company—if they even had insurance to begin with. “There are still some people who have yet to get back to their homes,” says Cohen. NYC’s Build It Back program says that by the end of 2016, 90 percent of its participants had received aid and/or began construction on their homes, and 76 percent of single-family homes were completed. But those stats are boosted by the fact that more than half of the program’s 20,000 applicants have dropped out or been disqualified. “It is startling you have so many people in need, but for one reason or another they’re dropping out,” Schlegelmilch says. “We need to understand why people have left.” He suspects many were frustrated with trying to navigate the program’s complex bureaucracy and paperwork. Meanwhile, for every year that someone doesn’t have a home, “they’re struggling to get back to a baseline while everyone else is moving forward,” says Schlegelmilch. And the effects of that displacement aren’t just physical. Families must find (and pay for) temporary housing while trying to get their careers back on track and their kids back in school. 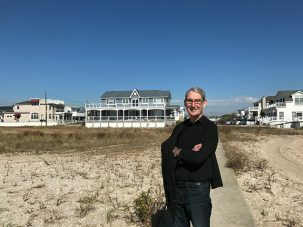 Long before Sandy struck his house, Klaus Jacob, a disaster and climate expert at Columbia’s Lamont-Doherty Earth Observatory, drew up plans to elevate his home in Piermont, New York. But because of zoning restrictions, he wasn’t allowed to raise it as high as he thought was necessary. “Sandy came and I had two-and-a-half feet of water in my house, which was exactly the difference between what I wanted and they would allow,” he says. So, instead of spending $15,000 dollars to add on few extra feet while his house was already being lifted, he spent $40,000 repairing the flood damage and wet-proofing the ground flood. 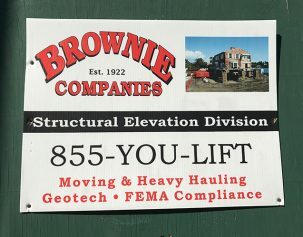 The town’s zoning restrictions have since been updated, allowing residents to elevate their homes to at or above Sandy’s flood levels, and a few neighbors have raised their houses on higher foundations. It isn’t cheap, though—Jacob estimates that starting a new construction project to elevate his house those few additional feet would have cost at least $100,000. In addition to elevating homes and converting ground floors into storage areas, the city is repairing sea barriers, building and replenishing sand dunes, and incorporating more green areas and permeable structures that will help absorb floodwaters. The new Rockaway Boardwalk replaces a wooden boardwalk swept away by Sandy with concrete, sandbags, and other coastal protection measures. Columbia architect Kate Orff has plans to build a breakwater around the south shore of Staten Island, another area that suffered badly in Sandy’s path of destruction. The project, called Living Breakwaters, would use manmade oyster beds to absorb wave energy and prevent coastal erosion, while cleaning the water and creating a natural habitat for fish and other marine animals. The project has received funding from New York State and construction is expected to begin in 2018. To examine how best to protect the New York City region, researchers from Columbia’s School of Engineering and Applied Science are teaming up with the International Research Institute for Climate and Society and the National Center for Atmospheric Research. By combining information about sea level rise, storm severity, and potential flooding levels into computer models, the team will evaluate the effectiveness of suggestions such as seawalls, artificial sand dunes, and a proposal to build a giant gate near the Verrazano-Narrows bridge that closes off the passage to New York Harbor when a storm approaches. The study will help to specify where these structures would be most useful, how high they need to be, whether there are less costly options that provide the same amount of protection, and whether they might exacerbate flooding elsewhere. In 2012, Hurricane Sandy flooded the New York City subways with millions of gallons of water. The MTA was able to get most of the trains back up and running within a few days after the storm, but the damage would have been much worse if it hadn’t been for Jacob’s 2011 study, which predicted which tunnels would flood. Based on his assessment of the system’s vulnerabilities, the MTA removed many of its underground electrical control and signal systems before the storm hit, to save them from saltwater corrosion. Without the ‘playbook’ that Jacob devised, he estimates recovery would have taken four weeks and cost the economy tens of billions of dollars. Despite these positive steps toward protecting New York City’s infrastructure and some communities, many think the measures don’t go far enough. Residents of Belle Harbor and Neponsit in the Rockaways are calling for greater protection, and Jacob says that “development still continues around New York City often in total ignorance of long-term flooding conditions from sea level rise.” He thinks the government should be pushing buyout programs in low-lying, low-density areas like the Rockaways, which are expected to be mostly underwater by 2100. In lower Manhattan, where a buyout program isn’t feasible, Jacob suggests abandoning the basements and ground floors of skyscrapers, or at least relocating critical utilities to a higher floor. Resilience isn’t just physical. Building barricades and lifting homes can take years or decades, but Sandy taught the city lessons in emergency preparedness and response that we can benefit from today. For one thing, Sandy shows that the city’s mandatory evacuations for low-lying areas worked, says Mutter. “The death toll was actually quite low given the number of people that were affected,” he says. In addition, since Hurricane Sandy (and Katrina before it), governments have gotten better at having emergency resources pre-deployed before the storm hits, says Schlegelmilch. They’re also better able to integrate federal resources into the state and local levels, and to work with non-traditional first responders, such as the faith-based organizations that sometimes get to the disaster site before FEMA does. With Hurricane Sandy, flooding caused most of the devastation in the New York City area. But future storms may be different. Wind was the major problem when Hurricane Maria struck Puerto Rico a month ago; millions of people are still reeling from the damages. The problem with disaster preparedness is that you’re always fighting the last war, says Cohen. “You really don’t know what’s going to happen and who will be impacted in what way. 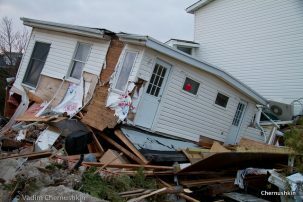 You can’t be fully prepared for it.” But if a clone of Hurricane Sandy were to strike New York next week, he thinks that New York would do better this time around, thanks to the infrastructure upgrades and emergency response lessons. However, the road to recovery is a long one. Schlegelmilch says it generally takes a decade or longer to recover from a large natural disaster like Hurricane Sandy. By his measure—and many others—we’re halfway there at best.